Sweethearts Three offers handmade, kosher for Passover chocolates that are second-to-none. We produce products similar to some of those offered the rest of the year, but all ingredients are certified kosher for Passover. All items are pareve. We are licensed by the Rabbinical Council of New England and our products are certified kosher under the Orthodox supervision of the Vaad Harabonim of Massachusetts. We are the only shop in the Boston area producing handmade chocolates for Passover. We convert to separate Pesach-only chocolate tempering equipment, supplies and utensils. For more information on how we do this, please read this article from The Jewish Daily Forward (or click here for more news articles). For complete shipping information please click here. Passover chocolates will be produced and available for sale or shipment from March 18 - April 18, 2019 only. Please order early! Due to a specific production timetable, Passover chocolates will be produced and available for sale or shipment from March 18 - April 18, 2019 only. Please place your orders early, since supplies are limited and many items will sell out. We will hold your advance order and ship it to you at the appropriate time (or you can specify the shipping date when you order). Please Note: we will be closed for the week of Pesach (Passover). Passover chocolates are only produced and available for sale or shipment during a limited time prior to Passover each year . Please send us an email if you would like to be notified next year. 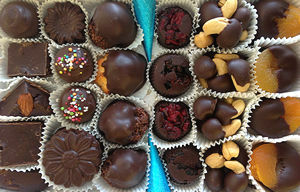 We make a selection of fine handmade Kosher for Passover chocolates. Choose one variety or an assortment. For multiple orders shipping to to different addresses, please call us. Click here for complete shipping information. Kosher for Passover handmade chocolates are available in the following sizes. This selection includes some of each variety below. A 10 inch chocolate Seder plate covered with dipped fruits and nuts, truffles, chocolate macaroons, raisin clusters and more. Note: for shipping the Seder plate is sent as a separate component, along with the box of chocolates for you to place on top. 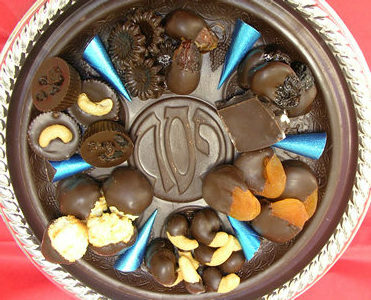 A chocolate basket weighing almost a pound filled with one and a half pounds of our assorted Passover chocolates. A chocolate basket weighing approximately 1/4 pound filled with assorted Passover chocolates. A whole sheet of matzoh smothered in bittersweet chocolate. A solid chocolate lollipop in an ice cream cone shape and many other shapes. A solid chocolate frog that makes a fun addition to your Passover table. A solid chocolate cow that makes a fun addition to your Passover table. 1) If the weather is warm or you are shipping to a warm location, please click here.